Forum Index > Off-topic Talk > Carolingian arms and armor sources? Posted: Sun 16 Sep, 2012 8:43 am Post subject: Carolingian arms and armor sources? Geibig wrote THE work on swords of the period. Peirce´s book on Viking swords is also applicable as Viking sword = Carolingian sword (for most purposes). Hmmmm. I should have been more specific: readily available sources... I have the Viking Sword book, I was looking more for armor, tactics, clothing, lifestyle, etc. I would love to have access to the Geibig book! 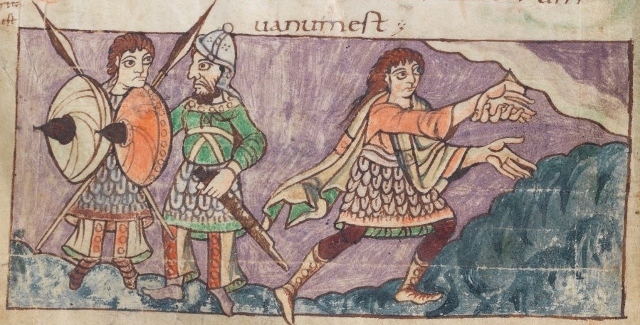 FWIW, the Stuttgart Psalter is now online, so you don't have to keep relying on old b&w images. 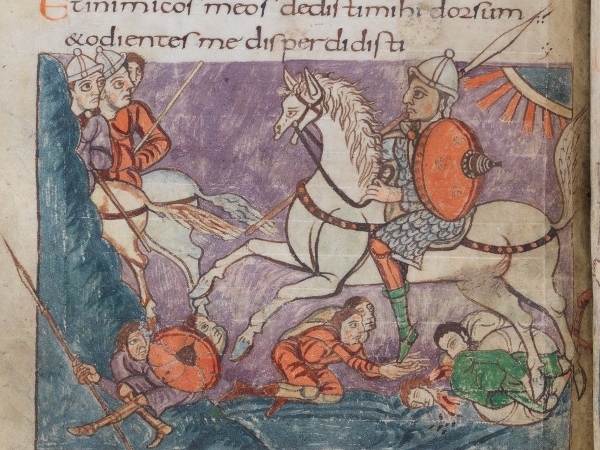 These from the Corbie Psalter, early 9th century. I've got a busy day ahead, and I just spent too much time trying to track down a bunch of images, with no luck. Essentially, I wanted to point out that several of the Carolingian images show something that looks like scale or lamellar with either something wrapped over the stomach or a gap between an upper body defense and a skirt. If you look closely, the midsection is coloured the same as all of the metallic bits, and has little circles in it. My guess is that this part is depicting mail. It also looks to me like the little lines on the scales could be the lacing pattern we often see on lamellar. I know that there is a whole can of worms about lamellar over mail, and the use of lamellar in western Europe. However, this looks similar to a Byzantine image that I cannot currently locate that clearly shows this exact setup: Lamellar upper torso and skirt over mail with a significant gap in the lamellar at the abdomen. I'll try to pull more of this together later, but someone else may have the images more readily to hand. Caveat: I personally admit that I would love there to be evidence of western lamellar. Where you see lacing in the Stuttgart Psalter, a see embossed ridges in scales. The Byzantine method of wearing torso armor and an apron over mail is much debated. I understand your interpretation of those images as ridged scales, and it's certainly possible. My counter-argument is that the book shows images of scales both with and without the mark. All of the images with the mark show either some sort of partial or divided armour, or the waistline is obscured by a shield or something similar. 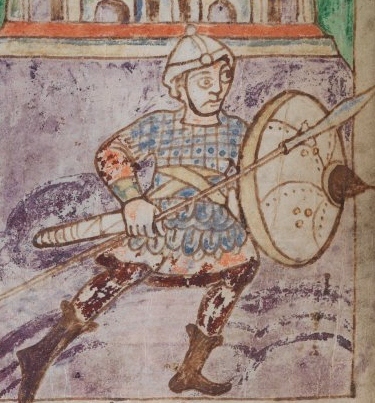 Most of the images without the extra line show a tunic-like armour that goes to the knees, and none of them have the two part construction. Why? My guess is that they are two different types of armour being depicted; lamellar and scale. My understanding is that scale is flexible enough to wear a knee-length armour (like a hauberk, although I don't believe that term applies outside of actual mail). Lamellar is more rigid, so having a more flexible armour at the waist makes sense, or likewise having lamellar that is only shirt length makes sense. I am aware that the use of lamellar in conjunction with mail by Byzantines is hotly debated. That fact is one of the worms in the can I mentioned above! I'll admit I'm not an expert in this particular area, and that I have a preference for the conclusion I am drawing, but I think it is a reasonable (though far from the only!) interpretation of the data. I'd love to see more discussion on both sides from people who are more expert than me.